Research Note: Margaret wrote: "According to my mother the family originated from South Africa but I do not know if this is correct as she doesn't seem to know too much herself and a lot of what she believes was told to her as a child.. My mother insists that her grandfather George Uridge died in South Africa after an accident and her grandmother Ellen returned to England with her children (Percy, George, Ernest and Marjorie), she also insists that all the children were born in South Africa, and that her grandmother was Ellen". In February 2007, Margaret contacted her elderly uncle. Margaret wrote "My uncle mentioned that he thought that his ancestors were from Kent and that George's father was William - he also said that he was told as a child that George was in the British Army and had travelled to either America or Australia. He mentioned something to do with the Bore War and that George at one stage was in Holland and eventually travelled to South Africa. He also said that he thought that George met and married Ellen Cox before travelling to South Africa. He knows that their four children were all born in South Africa.2,18,19"
Research Note: Searched the GRO Consular Birth Indices for 1896-1910 for their children, all believed to have been born in South Africa. However nothing currently found. [S731] E-mail from Margaret Luby to Teresa Pask dated 20 March 2006. [S731] E-mail from Margaret Luby to Teresa Pask dated 21 March 2006. [S2] GRO Indexes to Births "1866/Q2 URIDGE, George James Lewisham 1d 841." [S20] Website Miscellaneous (www.national archsrch.gov.za Inquest details). [S731] E-mail from Margaret Luby to Teresa Pask dated 3 August 2018. [S11] Index to Wills, 1860 to 1989, URIDGE Caroline of Chaveny Down Ascot Berks widow Died 6 January 1944 at London Road Winkfield Berkshire Probate Llandudno 2 March to Alice BRANT (wife of Charles Edward BRANT) Effects £ 145 2s 7d. [S4] GRO Indexes to Deaths "1944/Q1 URIDGE, Caroline Windsor 2c 663 age 83." [S731] E-mail from Margaret Luby to Teresa Pask dated 24 March 2006. [S731] E-mail from Margaret Luby to Teresa Pask dated 27 February 2007. [S1077] 1901 Census RG13 Piece 1163 Folio 57 Page 11. [S6] Teresa Pask's Guesses, Theories and Speculation : Assumption based on 1901 census details. [S757] Copy marriage certificate of Richard George Uridge and Ivy Margaret Watson (30 July 1927). Kindly provided by Margaret Luby. In a document dated c1905, he is referred to as "Henry Uridge also called Harry (alive) seen recently in England.14"
[S1074] 1871 Census Birth Place: Sydenham. [S3] GRO Indexes to Marriages "1853/Q1 Strand 1b 451." [S16] Letter from John R. Thomas to Teresa Pask: Father J.S.H. Gibbins? [S3] GRO Indexes to Marriages "1853/Q1 URIDGE, James = GIBBINS , Adile (Adele) Victorine Strand 1b 451." [S16] Letter from John R. Thomas to Teresa Pask: 1861 Chailey Census. [S4] GRO Indexes to Deaths "1882/Q4 URIDGE, James Lewes 2b 101 age 54." [S113] Index to Burials and Tombstones, 17 November 2001, Monumental small cross: In loving rememberance of James URIDGE who died November 17th 1882 aged 54 years. For so giveth his belowed sleep. 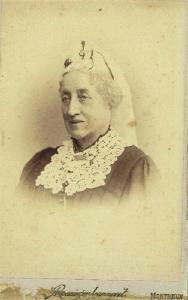 Also of Adele Victorine URIDGE widow of the above who died April 5th 1915 aged 84 years. I know that my redeemer liveth. [S120] E-mail from Humphrey Stead to Teresa Pask dated 25 July 2009: I found this photo on the Asslinger site, supposedly AVG, "Little Grandma". [S4] GRO Indexes to Deaths "1915/Q2 URIDGE, Adele Victorine Lewes 2b 235 age 84." [S127] Baptisms Transcript, St. Bartholomews, Sydenham, Kent, 1832-1919 John s John & Sarah URIDGE of Sydenham Common, Labourer. [S4] GRO Indexes to Deaths "1838/Q3 Lewisham 5 185." [S129] Burials Transcript, St. Bartholomews, Sydenham, Kent, 1832-1923 John URIDGE of Sydenham @ 19 months. [S765] Original marriage certificate of John Uridge and Sarah Hall (10 December 1847). Kindly provided by Kathleen Uridge. [S3] GRO Indexes to Marriages "1848/Q4 URIDGE, Richard St George Southwark 4 490." [S3] GRO Indexes to Marriages "1848/Q4 HALL, Sarah St George Southwark 4 490." [S4] GRO Indexes to Deaths "1881/Q4 URIDGE, Sarah Lewisham 1d 687 age 59." [S761] Family Documents kindly provided by Kathleen Uridge to Teresa Pask, September 2006 FuneralBill_1881_Uridge_Sarah: "For the Funeral of Sarah Louisa Uridge Died 25th Octr 1881 Aged 59 years £6 5s." [S3] GRO Indexes to Marriages "1848/Q4 URIDGE, Richard St. George Southwark 4 490." [S42] Miscellaneous SOG Material (information to be verified), Marriages. [S4] GRO Indexes to Deaths "1870/Q1 Lewisham 1d 600 Age 52." [S774] Original marriage certificate of John Thomas Uridge and Sarah Spinks (16 March 1869). Kindly provided by Kathleen Uridge. [S712] Transcript of the marriage of John Thomas Uridge and Sarah Spinks, 16 March 1869. Kindly provided by Marion Harper Hopkins - GOONS Marriage Challenge. Date of Birth 12 Oct 1829. [S2] GRO Indexes to Births "GRO Online Index: 1872/Q3 URIDGE, Thomas WOND Lewisham 1d 881." [S332] E-mail from Judith Batt to Teresa Pask, dated October 25, 2002 : New Zealand1893 Roll for Wellington City. [S14] E-mail from Christine Thomas to Teresa Pask dated 16 May 2000: Picture of wedding held. [S103] E-mail from Kevin Sartorelli to Teresa Pask October 8, 2001. [S344] E-mail from Judith Batt to Teresa Pask, dated October 31, 2002 : NZ Marriages 1893 No. 404. [S878] Website Births, Deaths & Marriages Online New Zealand (https://www.bdmhistoricalrecords.dia.govt.nz/home/) Marriages: 1893/1014 Fanny Norman = Thomas Uridge. [S332] E-mail from Judith Batt to Teresa Pask, dated October 25, 2002 : New Zealand Wise Directories 1900 & 1906. [S332] E-mail from Judith Batt to Teresa Pask, dated October 25, 2002 : New Zealand Wise Directories 1918 & 1925. [S897] E-mail from Murray Jordan to Teresa Pask dated 28 July 2016. [S103] E-mail from Kevin Sartorelli to Teresa Pask October 6, 2001. [S878] Website Births, Deaths & Marriages Online New Zealand (https://www.bdmhistoricalrecords.dia.govt.nz/home/) Deaths: 1952/29880 Uridge Thomas 81Y. [S878] Website Births, Deaths & Marriages Online New Zealand (https://www.bdmhistoricalrecords.dia.govt.nz/home/) 1893/17824 Uridge Harriet May Annie Thomas. [S96] E-mail from Bruce Thomas Uridge to Teresa Pask dated 3 February 2001; (received 16 May 2001). [S103] E-mail from Kevin Sartorelli to Teresa Pask dated 8 October 2001. [S878] Website Births, Deaths & Marriages Online New Zealand (https://www.bdmhistoricalrecords.dia.govt.nz/home/) 1895/14555 Uridge Francis Thomas Fanny Thomas. [S878] Website Births, Deaths & Marriages Online New Zealand (https://www.bdmhistoricalrecords.dia.govt.nz/home/) Birth Index: 1898/13263 Uridge Richard William Fanny Thomas. [S878] Website Births, Deaths & Marriages Online New Zealand (https://www.bdmhistoricalrecords.dia.govt.nz/home/) 1900/3906 Uridge Irene Ethel Fanny Thomas. [S2] GRO Indexes to Births "1862/Q3 URIDGE, Walter St Luke 1b 591." [S4] GRO Indexes to Deaths "1938/Q3 URIDGE, Walter Westminster 1a 441 age 77." [S4] GRO Indexes to Deaths "Lewisham 1d 664 age 66."